BBNaija: 6 Unique Things to Learn from Efe as the Winner of BBNaija 2017. 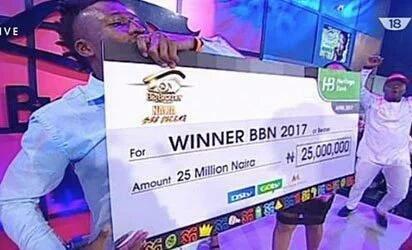 It is no longer news that Efe Michael Ejeba has been declared the winner of the second edition of Big Brother Naija reality show after garnering 57.6% of the votes among the last five contestants on the show. Efe was named winner after 77 days of tears, tantrums, good times, shocking exits and a little dose of romance. He and Bisola were the last two contestants after Marvis, Debbie Rise and TBoss had been evicted. The most startling part of the show was the margin by which Efe defeated the other four housemates, particularly the first runner up Bisola. Efe scored 57.61% compared to Bisola who got a mere 18.54% contrary to the general belief that it would turnout to be a close call between the two top contestants. As fate might have it, the "Warri-born" who is known for his "based on logistics" slogan got over half of the entire votes of the remaining four housemates. Wow! Indeed, "Warri no dey carry last." As the winner, Efe will be leaving with 25million naira with one SUV car! Wow! So sweet! Well, TBoss and the first runner up, Bisola, never went home empty handed. TBoss won the PayPorte Arena games and went home with N500,000 cash prize. Bisola won the ONE Campaign Back to School Challenge for the girl child and will be travelling to New York to deliver her winning presentation. Where ever you find yourself, do not wear a different personality; just be you. People love you for who you are. 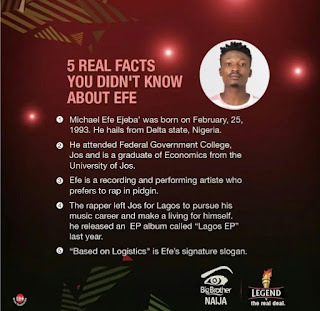 Unlike Tboss, Efe represented originality and a lot of persons connected with him. He was never influenced by what he was surrounded with. Your name matters in life as it has a way of influencing your destiny. Efe means Wealth and you can see where his name has landed him. Therefore, it is important you answer good names and also give your children good names. Uniqueness with a little bit of craziness makes you very unique. This is the part I really love about Efe. Do you remember the first time Efe got into the house? Did you see how he took off his shirt to demonstrate how he would celebrate winning the grand prize? That was really unique and crazy. That singular crazy attitude instantly got him lot of fans. But for the fact that he was held, he almost did same when he was announced as the winner of the show. Only the truth can set you free. Remember, lies evicted Gifty and TTT. Efe was all honest and clicked well with people. Never think you are fooling others by lying my dear. Efe won the hearts of many with his great charm of appeal and energy. You could feel Efe’s energy althrough the show. Warri! Warri! Warri! Their father! Their real dads! With this, you are good to go. Remember Warri no dey carry last. Instead of Warri go carry last, NEPA go take light or e go be draw. Lol! 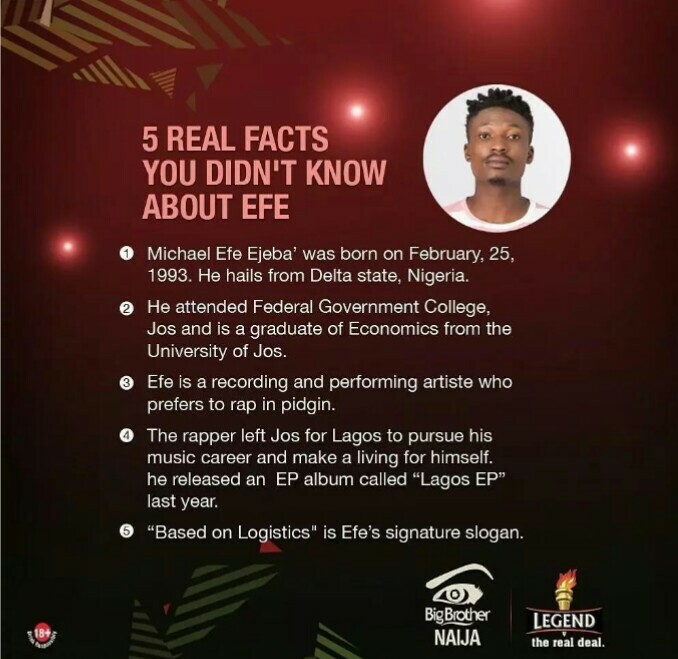 Efe is a Warri guy and his victory validated the authenticity of this statement, "Warri no dey carry last" as he emerged winner of the second edition of the BBNaija show. Therefore, I advise you become a citizen of Warri.